Provide comfort for the family of Peggy Jo (Peterson) Bender with a meaningful gesture of sympathy. Peggy Jo (Peterson) Bender passed away February 10, 2019 at the Meadowood Health Pavilion in Bloomington, Indiana. Peggy was born to Edward and Erma (Hoke) Peterson on January 19, 1938. Peggy was an avid dog lover, she loved, spoiled and cherished her pets very much. Peggy graduated from University High School in 1956 and attended Indiana University. 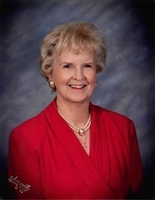 Peggy's love of politics led her to being an active member in the National Federation of Republican Women and Indiana Federation of Republican Women including the 8th District Director and worked on several local and national campaigns. She was a proud member of The Daughters of the American Revolution and Psi Iota Xi, philanthropic organization. She was a Sunday school teacher at the First Christian Church for several years. Peggy was preceded in death by her parents Edward and Erma Peterson, her son Todd H. Bender and her brother-in-law, Tom Deckard. Peggy is survived by two sons, Mark Bender, Scott Bender and his wife Elizabeth, her sister Jeannie Deckard, a brother Bill Peterson, two nieces Debby J. Deckard and Deanilee Deckard, two nephews Andy Peterson and Billy Peterson. The family would like to express their gratitude to all of the Comfort Keepers Caregivers that cared for Peggy during her lengthy illness with special thanks to Stacey Prifogle and Kristie Ryan who provided exemplary care for Peggy during the final part of her journey. Visitation will be held on Wednesday, February 13, 2019 from 11:00 am until 1:00 pm at The Funeral Chapel of Powell and Deckard, 3000 E. Third St. Bloomington with services at 1:00 pm following the visitation. Peggy will be laid to rest at Clear Creek Cemetery next to her son Todd. Memorial contributions may be made to the Monroe County Humane Association, The Salvation Army or the Alzheimer's Association. We encourage you to share your most beloved memories of Peggy Jo (Peterson) here, so that the family and other loved ones can always see it. You can upload cherished photographs, or share your favorite stories, and can even comment on those shared by others. Our sincerest condolences go out to the family.